Three-year project looking for alternatives to substances categorised as very high concern. 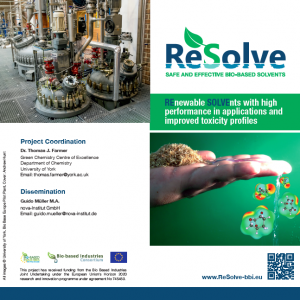 ReSolve, a €4.3 million EU project focused on replacing traditional, fossil-based solvents, with safer bio-based ones, was officially launched on 15th June 2017. Led by the University of York, the project consortium is comprised of 11 partners from 5 countries and is due to finish in May 2020. The project is set to demonstrate production of novel alternatives to replace the hazardous conventional solvents toluene and N-methyl-2-pyrrolidone (NMP), create an additional pipeline of bio-based solvents, establish a toxicological safety testing strategy and evaluate possible production processes of the most advanced bio-based solvent candidates, benchmarked against these conventional solvents.